Downsides that I can see is that the crate has a message on it in permanent marker. And the case is unopened so I'm not entirely sure what the labels are like. I've had a price of £400 offered by The London Wine Cellar, but as of yet they haven't got back to me in regards to a couple of questions I had. I'm based in Holmfirth W. Yorks. Retail value for that case looks like it's running around £600, so an offer of £400 from a merchant seems fairly reasonable to me. Based on the £600 retail price, that's also roughly what I'd expect to see from a private transaction. 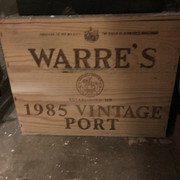 It's a good Port. A shame that you're not a Port drinker, as that'd be my advice - drink it yourself! Thank you Glenn for the helpful reply, and the price range I should hope to see. I'd be more than happy to see offers in that region, I've got some home improvement projects that this would certainly help kickstart!